Pictures of trains passing through Tooting. These now historically interesting pictures were taken on the same day as picture 72. In picture Pc1 the nearest tram is on SMET Route 6 [Tooting - Croydon] and the furthest tram is on LCC Route 12 [Tooting - Willesden]. At the time the picture was taken the tracks at this location were not joined and is therefore dated around 1919. The LCC tram obtained its power from the conduit system, while the SMET car was using the more conventional overhead wire. To facilitate through running between the LCC and SMET's networks, the tracks were physically joined [just by the entrance to Tooting Junction Market in Picture 72] on 4 November 1926. This required the construction of a change pit [approximately located where the RTL bus was caught on camera in Picture 72] and was around 100 yards prior to the end of the conduit itself. This required the SMET overhead to be extended up to the new change pit. This short section of track could be used with either power source, and while normally the 'plough' would be dumped for trams travelling in the Croydon direction, a conduit point could be operated by the attendant so that trams could use the former terminus conduit crossover conveniently. A somewhat unique feature for a change pit! Through services started on 6 December 1926. 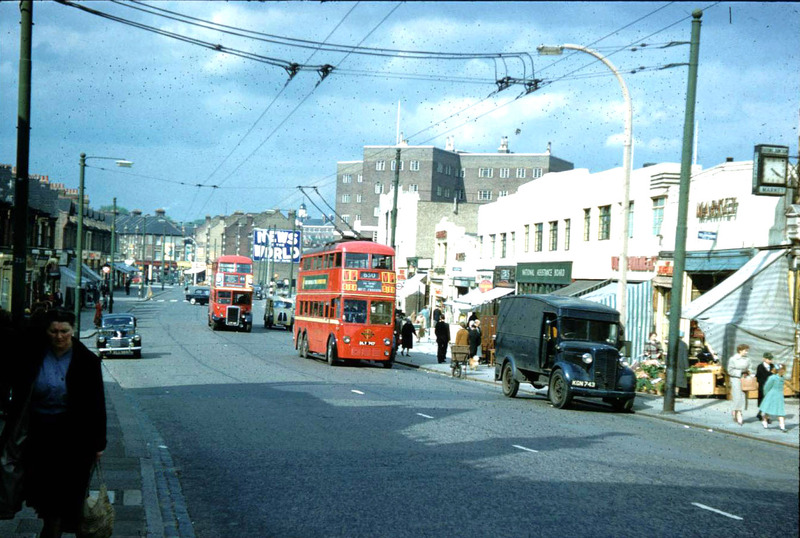 Picture 72 was taken on Saturday, 7 February, 1959 [apparently at 20 past 4 judging by the clock at the entrance to Tooting Market] and shows Mitcham Road with a trolleybus approaching Tooting Station [the rail line between Streatham and Wimbledon]. At the time newspapers and magazines had articles on Buddy Holly, who had died a few days earlier. These views are very interesting. For about 6 months in 1949, when my family first came to London, I lived in Longley Road, which is the road going off to the left of the public house in the tram picture, so I knew this bit of road very well; the old Tooting Station which features on one of your other pages is only about 250 yards away down Longley Road. The photographer in Picture Pc1 is almost standing on the railway bridge, whereas Picture 72 is taken a little lower down the slope from between Longley Road and Renmuir Street which is the turning on the left by the trams in the older view. Both views are looking north and the curve in the far distance takes the road round to Amen Corner where the Mitcham/Croydon routes will have diverged from the Streatham/Brixton routes. Interestingly, the SMET terminus is on the north side of the railway bridge which places it just over the LCC boundary which was effectively at the railway bridge. At the far end of Longley Road there was another change pit for the Wimbledon services. When I went to Junior school in Sellincourt Road in 1949-51, I used to sneak out at lunchtime to go and watch the trams changing from plough to overhead and vice versa. 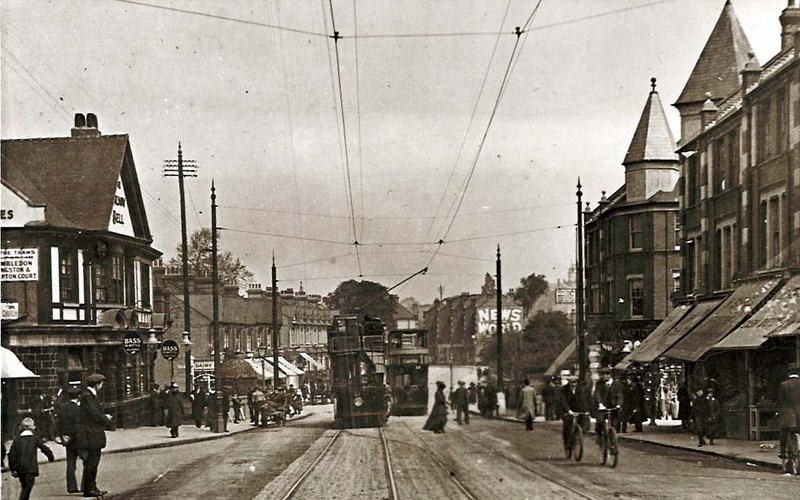 Your information about the link in 1926 is correct and from that date, route 30 was extended to West Croydon and the SMET Tooting-Croydon service curtailed at Mitcham Fair Green. I run the butchers shop just visible on the trolley bus photograph almost dead opposite the bus. My grandfather opened the shop in 1900 and its still owned and run by the family. Pictures I have of trams on this stretch of road are shown on this page as Pc1 and Pc2. They are taken from almost the same spot as the trolleybus photograph  and are of LCC and SMET trams at their respective termini. Another photograph will be added later [Cp3] and is a view of the railway station looking towards Mitcham with a Croydon bound tram in the distance. The old Surrey boundary still exists, only now its the boundary between Merton and Wandsworth and in fact the shops on the right are in Merton while the entire road is in Wandsworth, the river Gravney runs under the pavement on the right and is in fact the boundary line. A 1999 map of the area showing the border between Surrey and London as a mauve line with a red line indicating the postcode boundary. As I child I lived at Tooting Junction and can remember standing at the bus stop north of the section feed with my ear to the standard listening for a trolleybus. The Trolley is on the border between what was London and Surrey in 1959 - in fact on the Surrey side of the road. At 10.00pm when pubs closed in Mitcham [Surrey] people would flood over the road to the Railway Bell in Wandsworth [London]. The large building to the rear of the picture is Tooting Police Station. Note the view of Victor Value, this was soon to be swallowed up by Tesco. Also of interest is the sign saying "You Can Phone Form Here" at the entrance to the little Market. The RTL on route 44 replaced the former 612 Trolleybus route in stage 1 of the post war buses for tram programme. The conversion took place on Sunday 1 October 1950. I was intrigued at the two contributions on this page. Like Geoff Bannister I also attended Sellincourt School, and I remember regularly going to Coppins. The words surrounding the clock, top right - it is Tooting Junction station bridge. Station approach to your left and behind you. Still a junction in 1959 - for the freight-only line to Merton Abbey and Merton Park - if that route hadn't been turned into a road, it might have been useful to Tramlink. A large new Sainsbury's Savacentre [Sainsbury's/ BHS / Mothercare all in one building] has been built on and by the former tracked of the Tooting - Merton Park line, opposite Merton Bus Garage. There's still a 'Station Road Sw19' marking the site of Merton Abbey Station, closed 1925, the track bed is the A24 now. Merton council has always had ambitions to get Tramlink to serve Mitcham town centre via some sort of loop [both Mitcham stations being out of the way rather], but the cash is never going to be there. Proposals for the diversion of Tramlink to this locality are shown on the TfL site. However, like the proposed Morden interchange, this was considered early on and rejected in favour of following throughout the under-used existing railway line. Time will tell if this was the right thing to do. Wonder how many other people have still-unpublished pictures of trams or trolleybuses hiding in a family album? Oddly, my mother's maiden name was Coppin, same as the butcher at Tooting Junction. She lived all her life at Wallington nearby - could be a relative. Geoff Bannister is right to say that the SMET route 6 was cut back to Fair Green when the Tooting Junction connection was installed but route 30 was not extended to West Croydon until 6th December 1933, when the former SMET 6 was withdrawn and the track from Fair Green to The Cricketers abandoned. 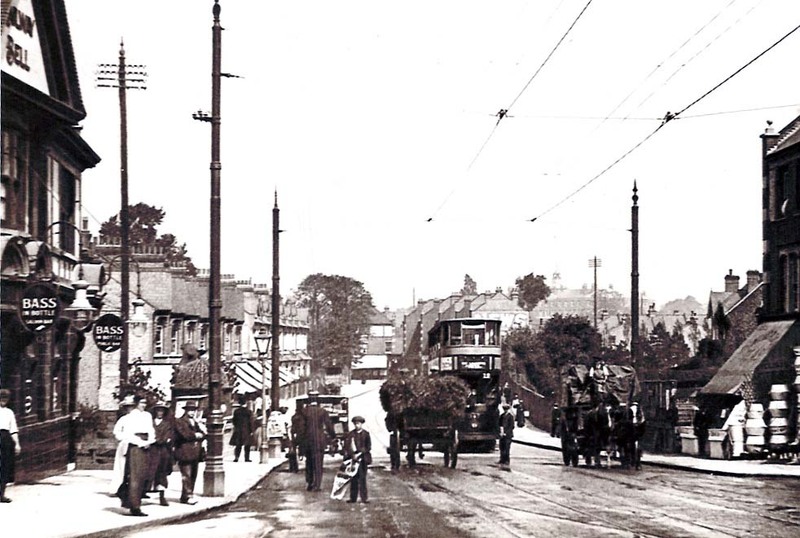 The LCC route 6 was extended from Tooting Junction to The Cricketers in 1926, at the time of the link-up. The LCC/Surrey boundary ran down the middle of the road between the railway bridge and the river, so the position of the terminus was in 'joint' territory! I do not think the earlier picture can be 1919 as the LCC tram has one of the original style of route number board hanging from the canopy, which were introduced when route numbers were adopted in about 1912. These were replaced by the Venner type, placed at the top of the front saloon window during 1913. So the picture must have been during 1912 or 1913. Had you noticed, by the way, that the advertisement hoarding in the background carries an advert for 'The News Of The World' in both photographs? I wonder if it had been there for the full forty-six years? I seem to remember that the "News Of The World" hoarding was in enamelled tinplate, so it could well have been there all that time. An interesting [well, to me!] anomaly caused by the county boundaries is that Tooting Police Station [the large building on the right in the later picture] does not stand in its own sub-division, which is part of Wandsworth, but in the area served by Mitcham Police Station, which is in Merton. So that technically any crime which may take place in the police station [or in the Section House behind and above it] has to be reported at another nick. It seems that trams may return to this street. There is a proposal for the Croydon Tramlink to be extended through Mitcham to Tooting via Fair Green and Figges Marsh, so some street running might well be necessary here. There would not appear to be an off-road alternative to bypass the Tooting Station pinch-point without demolishing quite a few properties. Further to Ken Glazier's contribution, I must apologise over getting the 30 extension date wrong; I misread some of the information in Oakley and Holland's "London Transport Tramways 1933-1952". There were too many route 6s in the equation!! A minor disagreement is that this book quotes the ex-SMET 6 and 30 alterations as 7th December 1933. Re the boundary, I felt the River Gravney was the fly in the ointment but as it has been culverted since the year dot and isn't usually shown on maps, its line is not well documented. I agree with your dating of the picture but I can not make out on what service the LCC car is working. At that time, the only two serving Tooting Junction would have been the 12/14 but my print-out of the picture seems to show a 2x number. Any comments? An examination of a better quality image indicates that the LCC tram is on route 12. Paul Coppin is correct about the River Graveney running under the pavement to the right of the tram pictures, but it's original course was to 'Tooting Lower Bridge' which would have been situated approximately at the junction of Renmuir Street and Mitcham Road, whence the river ran due west. So says a map of c1885. David, I thought you might like to know that your photograph #72, of a 630 trolleybus at Tooting Junction, provoked some very strong memories for me. I emigrated to Canada at age 10, in March 1958 [actually, 46 years ago on Saturday, the 13th], and before we flew out on the 10th of that month, my mother and I spent a few days with relatives at Tooting. They lived in a flat above a greengrocer's shop, actually one of the shops whose awnings are visible in the distance in the photo, almost directly opposite the police station. I spent a good part of the weekend watching the constant parade of route 44 buses and route 630 trolleybuses passing by on the road below, it was quite a superb vantage point for a young bus spotter, and I've been fascinated with London's trolleybus network ever since. Interestingly, the relation who lived at 252 Mitcham Road was an LT bus driver from Stockwell garage, Billy Guinnell, who sadly died just a year or two later; he was one of the only bus drivers I'd seen at the time who sported a rather large beard! Presumably the bridge in the background of one of the views is where Mitcham Road crossed the railway [? ], I recall the roadway rising up to the bridge from the hours spent leaning out of the window of the relation's flat, and the slope quite noticeable in picture #72. Incidentally the bus driver relation from Tooting, Billy Guinnell, was quite an imaginative character. He once took my aunt form Sheffield [now in her seventies, but in her early twenties at the time] on a tour of London, but he started the tour after he'd parked his bus at Stockwell at midnight or so, hence the tour lasted all night, and ended up in one of the all night cafes around Smithfield or Billingsgate, something she remembers vividly to this day. During that few days stay before embarking for Canada, we were supposed to meet up with him one night at Tooting Broadway or somewhere, where I was going to get the chance to climb in the cab of the RT for a minute. Alas, he never turned up, likely running late and turned short somewhere en route by a zealous LT inspector! Now I drive a Routemaster on weekends in the summer, on sight seeing work, so I did get in the cab of a London bus eventually! However, it took a few decades. Fascinating web site, thank you for posting the photographs. I was raised on the Bordergate Estate, Mitcham in the 1930's. My father was a bus driver driving the 80 route from Morden Station to Lower Kingswood, Later it left from Tooting Broadway. My mother shopped regularly on Mitcham Road. At Coppin's she bought our Sunday joint and Christmas turkey. At Sainsbury's next to Tooting Junction Station, she purchased butter and eggs; at the Co-Op close to Tooting Police Station, she purchased much of our fruit and vegetables from open stalls with lights strung out in wintertime during the late afternoons. Fantastic site. As a boy I lived in Southfields and used to walk down to Wandsworth and catch the Route 630 to Tooting. My memories of these fabulous vehicles is a happy one. Clean, silent and if my grey cells are recalling rightly, also fairly nippy. Thanks for the memory jogger. Just discovered this page. Boy this brings back some memories. I was born in Ascot Road behind Tooting Police station in 1944. I had no idea what existed on the site where Tooting nick was built but know I know. Neither did I know the Railway Bell pub was that old. My old dad, dead 42 years sunk many a pint in there as he did in the Gorringe just over the railway bridge between 1939 and 1964. My brother in law was a copper at Tooting nick from about 1948 until his retirement in 1959. He drove the area wireless car call sign "whisky 3". We have a lovely photo of him in uniform with his Humber patrol car where the 77a buses turned next to the Mitre Hotel in Tooting. I stood at the bus stop shown in picture 72 in 1959 waiting for a ride on one of the new Routmasters on route 220 which replaced the 630 trolleybuses. I wonder where all my old mates are who grew up with me around Tooting Junction in the 1940/50/60's? and all those old mates I worked with at the St Helier and Streatham stations of the London Ambulance Service from 1964 to 1971. It was such fun being a bus and coach fanatic in those days with all the different types. Anyone remember those brown Daimler buses on loan from Maidstone which worked the 80 route? I left Ascot Road to get married in 1970, firstly moving to Sutton then to Northamptonshire and finally to Somerset. The last time I was in Tooting Junction was 1993 when I was en route to visit my daughter at Kingston University - they say never go back. These days I enjoy a relaxing retirement in rural France - Tooting seems a thousand miles away. I am writing to say that having just spent most of the afternoon viewing your site, I found it to be very interesting, having moved from Paddington to Seely Road Tooting in 1947. Seely Road can just be seen beyond the police station and having spent over twenty years there, the picture brought back many happy times. The black van in the picture was the grocers van and along with the trade bike and white van they were always parked in the same positions for very many years. With regard to the boundary between Wandsworth and Merton. As I said before, the Gravney river is still the boundary running under the pavement on the police station side of the street. Someone said it appears on a map to cross the road at Renmuir Street; in fact it does cross the road at lower Tooting bridge but right next to the bridge and the railway line. It then continues to be the boundary in almost a straight line next to the railway and Longley Road passing 'Waterfall house' where it drops under the main road then continues past the hospital and Wimbledon Stadium to join the Wandle. Have just found this remarkable site showing various shots of Tooting, photograph #72 has stopped me in my track as the lady on the extreme left of the picture is my mother. We lived at 138 Longley Road. I was there from 1942 to 1970 before moving to Bracknell in Berkshire. I left school in 1959 which is about the time this picture was taken. My mother always shopped locally at the shops in the back ground, among then was the Co-op and Davy Greggs. I would dearly love to own a print from the photograph as it would be a lovely memory of my Mother who passed away in 1978. I discovered this site by accident. I was researching my old primary school Selling court Road when I noticed the picture of Tooting Junction; you can imagine the shock/surprise when I discovered the picture containing the image of my mother. This picture has brought back so many good memories. [Comment by David Bradley: Picture supplied]. There is a WEB Site devoted to the Tooting Area. Click on the logo above to connect. In return for the supply of the rare tram pictures, this site is happy to advertise this local shop: Coppin Bros are one of London's oldest surviving family butchers and still operate from their original south London site. In the last 100 years more than 15 family members have worked for the firm which is now run by Paul Coppin who joined the business when he left school 37 years ago aged 15.